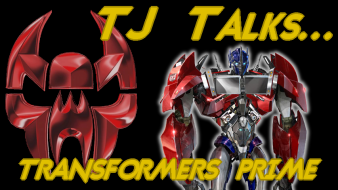 Reviewing the 2011 Transformers cartoon. When are you going to do My little pony:Friendship is Magic? I'd like to see/hear your thoughts on Power Rangers Samurai to be honest. I found the same problem. Everything Prime said was a motivational speech. For the text TJ Talks/ Vlog I'd like an overall intro to Kamen Rider with recommendations of where to start for new viewers. If you TF: Animated seems a bit too soon for a TJ TV, perhaps it would be good for a TJ Talks. One thing that turned me off if this show was Bumblebee not talking. Even though, I'm one of the ones that actually likes the movies, I never liked the fact that Bumblebee was a mute. I think, out of all the movies, Bumblebee literally only said one sentence. Steve Blum is Starscream?! SOLD! Steve Blum is one of my favorite voice actors since even before I knew Steve was playing people I grew up with like that robot from Toonami or Spike from Cowboy Bebop. TF:Prime is really good, and it's definitly one of the best Transformers series out there. Problem for me is, I just can't get into it. Yeah it does have action parts, character development, and season plot but the way each episode is organized (to me) it feels like ACTION... slow... Character development... slow... ACTION... slow... Dark Energon... slow... ACTION! I'm probably one of the only people who feels this way, but because I do feel this way it really detracts from my enjoyment of the series. I'll try to rewatch it in a marathon-style now that every S1 episode is out and see if that changes how I feel, but right now, I'd give it 3 1/2 out of 5. "What do you want next?" Do you watch Young Justice? Cause that cartoon (I feel) is one of the better ones of 2011. Beast Wars doesn't hold up. Prime is better. We're mostly in agreement about "Prime". I would recommend seeing 'Bee and Raf as one. They aren't built to work as standalone characters. They really exist to flesh each other out. With Raf it's kind of obvious (oddball super-kid that doesn't connect). More than that, I think 'Bee is supposed to connect to Raf as much as the audience. After all, in this show Bumblebee is kind of a kid (compared to the other Autobots) and he's one of the few who's implied to have been built into the War. There's some great stuff there for the character that hasn't been done before. Actually he said two sentences (-_-) Bay liked the talking through the stereo bit so much that he made them put it back. Sometimes I think Bay has problems. I pretty much agree with your analisys of the character, at least as far as robots are concerned. Arcee probably got the best out of it, her character is really fleshed out and saw some evolution in the whole story. Plus she got a great kharmic villain. Bulkhead is a little less defined, but works pretty well nonetheless. He's fun but he isn't dumb. He's still the big bulldozer from animated, but at least now he isn't the constant comic relief of the show. Ratchet is a bit of a downer. I love the grumpy old medic characterization and I love the character design (especially the medical backpack element), but he did really little in many episodes. It suit is old and weary character, but somehow detracts from the appeal. I also love his little rivalry with Jack's mom about cybernetc vs human medicine. Bumblebee took the short stick for sure, he has some great inputs, but failed to live up to them. Pretty much the same as Raf. As Greek Geek noticed the characters worked pretty well as ateam, but as stand alone they were boring. Optimus... well, Optimus was really a downer here. Until the final 3 parter when they fleshed him out properly I really hated this version of the character. Between a pretty uninspired performance from Cullen and some very lame lines ("Scrapheap" was major culprit here), prime never sounded like the powerful leader he's supposed to be. About the human I like all the three main characters for different reasons. Lots of people complained about Miko, but I really think she was funny - granted in an annoying way. She also works great as a counterpart to Jack more balanced behaviour. The main character fault is how overused she is. Pretty much in any episode not focused on Arcee and Jack, she's the one who do thing, usually dumb thing, while the others had to bail her out of trouble. Jack is probably my favourite because he's utterly normal. He's not a crazed fanboy, nor a pre-pubescent super-genius, he's a regular guy with normal problems and a very balanced view of life. On the other hand he showed some real guts and skills, and he visibly matured over the episodes. Raf is a problem, it's one of the few serious attempt to create a kid genius that behave like a kid, not some kid of weird super-compressed adult (yes, I'm looking at you Valeria Richards). I still have hope for season 2 to work to create some good episodes for him. The crowning glory of this cartoon are the Decepticons, every one of them is perfect for the role and I honestly shitted myself out when I heard Welker doing this new Megatron. It sounded more alien and threatening that the original one, but not as psychotic and deranged as the movie one. I hope you didn't take that personally, TJ. But my scathing hatred of that character just... just... she's MY Armada Hot Shot. you should talk about beavis and butthead. I'd like to know what your opinion is on PR samarai now that saban are back in control. have you seen tiger and bunny?if not you can watch it here:http://www.animefreak.tv/watch/tiger-bunny-online its about superheroes that are represented by sponsors,if you have seen it, what are your thoughts on it? I like what little of this series I've seen! The animation I like a lot better than Animated! My problem with Animated was the too cartoony style for the characters! Well, I don't know if you'll be glad or enraged like most but they're producing a 4th Transformers movie! Don't know if they're continuing the current franchise or rebooting it all depends on Bay! Me I think they can continue without him and probably repair some of the plot-holes and errors he created! I'd like to see you review an old cartoon from my childhood that no one seems to remember and it was called Skysurfers: Strike Force! You can get most of the 1st season on DVD, but they're like those Dollar Store DVD in the thin case with what appears to be where the person recording these DVDs forgot to cut off the commercial break! I'm going to be the odd one out and ask, what's your thoughts on a series like the recently (I believe anyway) completed Digimon Xros Wars... I hate it personally but what do you think, or if you haven't seen that maybe if you've started watching it Gundam AGE? Again if you haven't seen that I'll be typical and ask your opinions on PR Samurai? Every time I think about this show, I think Miko must've been named after AbareKiller, then I think "nah, that's stupid." Transformers Beast Wars and Beast Machines.. They confirmed that they are making a Transformers 4, but it will involve Unicron! so i counted some of the power rangers samurai related coments, i read 7 coments, and 5 of them were samurai. i think you should totally do a talks for samurai. I mean, don't get me wrong, the new Screamer seemed awesome at first, but he quickly went from clever and competent master schemer to blithering idiot whom I can't take seriously as a threat to Megatron or Prime. I mean, if Wheeljack can be rewritten into a gungho commando & Arcee into a fem fatale, why can't Starscream be remade into a competent 2nd in command & potential threat to Megatron? In the beginning he seemed menacing, powerful, skillful...Then he quickly degenerates into the most pathetic & comical incarnation of Starscream ever, I mean, we're expected to believe this spineless loser actually managed to achieve the title of 2nd in command of the cons when everyone keeps outwitting or overpowering him? He's quickly becoming the Waspinator of Prime I fear & its a disappointment really. I think you would explode from all the swearing if you tried to do a TJ TV on Power Ranger Samurai. It's THAT bad. Do you want to talk about "Power Rangers Samurai"? I would think the better thing would be to talk about "Samurai Sentai Shinkengers" or better yet the Shinkenger/Decade crossover. Why haven't you been on the Primetime podcast for season two? It feels like you should be there because you said you like Miko and Season two has been very much Miko and Bulkhead. With Miko confronting that she's rather useless, and Bulkhead getting in some good action, and facing death every other mission. Was it just a schedualing thing or did you get kicked out? Actually, it came out in November 2010. The description`s wrong. please do the Beast Wars.